Over the years, there have been several new paint brush colors released. While each proves more fascinating than the last, one cannot deny that the lab-ray color only pets are the most interesting colors of all. Why would you want a boring old starry Gelert when you could be the proud new owner of a pea Chia? The edible pets are some of the most fun, interesting, and downright silly pets of Neopia. There is only one problem when it comes to edible pets: how to customise them. People always have trouble finding the perfect customisation with these pets. In this article I am going to make your apple Chia (and other tasty pets) go from dull to delightful! Fruit and Veggie Chias are some of the most fun pets to dress up! What many people do not realize is how many wearable are available to match your pet! The main problem Neopians have is that these pets are not able to wear any kinds of shirts, dresses, slacks, or clothing in general. The main thing to focus on is adding the perfect background and foregrounds. We will start with the famous Asparagus Chia. The Asparagus Foreground and Asparagus String Lights both match your Chia flawlessly. All you need to do is pick the perfect background! The Gross Food Buffet Background both matches your look and is also very feasible. Let’s try out another fruit/veggie Chia. The Apple Chia has several dashing items to match. We will start with the Apple Orchard Background. The Apple Chia and Apple Orchard Background are perfect for each other! There are also several other items including the Bobbing for Apples Trinket and Apple Orchard Foreground to give your Apple Chia the perfect corresponding look. For other fruit or veggie Chias that do not have quite such a perfect matching background, why not try out the Decorative Bowl of Fruit Background? It can make any fruit/veggie look spectacular. The Gadgadsbogen Fruit Background is another fine option for those without neocash access. Are you on a budget? Have no fear; the Citrus Background is perfect for those Neopians rationing their neopoints. Once you have picked out your favorite background, it is time to spice up your customisation. There are several items, both neopoint and neocash, that are surely just what you need. The Crate of Fruit is just the thing to add to your fruit Chia’s customization. Fresh Berry Balloons or a Raspberry Plushie are both great items to add more décor to your customization. The Raspberry Plushie is not only super cute, but wearable! Play Time String Lights or a Carrot Garland both top off the customization delightfully. For those edible pets wanting a cute seasonal look, I suggest trying on the Cornucopia Background. It goes perfect with almost any pet! You can add a Cornucopia Foreground and be ready to go for when the fall season comes around! Not ready for fall yet and wish it was still summer? The Summer Picnic Background is the perfect background for any Neopet. This background is also one of my favorites since there are so many items that can go great with it! My personal recommendation is the Summer Picnic. Mix and match your own items with this background and you will be able to see just how many items go great with it! Now that you have ideas on how to customise your fruit or veggie Chia, we will move on to another popular Neopet: the Coconut JubJub! For this particular Neopet, I suggest going with a more tropical theme. Both the Beach Resort Background and the Museum Habitat Background are exquisite choices. Ahhh, it feels like summer already! Just seeing your beautiful Coconut JubJub makes me want to break out a nice cup of Twirly Fruit Juice! But back to the customising. The Bamboo Leaf Wrapped Fence Foreground looks wonderful if you like a jungle theme. The Lighted Palm Tree is also a grand choice! If you are not lucky enough to own a Coconut JubJub, have no fear. Your Chia can wear its own Coconut Chia Suit. This suit is, in fact, one of the silliest and most awesome costumes available. What’s that? You don’t have a Chia either? Well, you are in luck, folks, because you can also grab your very own Evil Coconut Mask. Really, it looks the same as a Coconut JubJub! (Err... almost). If you are not really into the whole fruit or veggie thing, I am positive you love JELLY! Nobody can resist that cute little Jelly Draik or Cybunny. The fun thing with Jelly pets is that you can really customise them however you’d like! Jelly pets come in all different colors, so personally I like color-coding them. It is important to note that unlike the previous colors discussed, Jelly pets can actually wear clothing! The Jelly Cybunny is pink, so I would choose other pink items such as a Figure Skating Dress. The Jelly Lupe is blue and great for *nom* *nom* *nom*- I mean customising! Mix and match however you’d like, but if you are having trouble, there is always the Giant Jelly Background. Watch as this background bounces back and forth. It really makes you want to go play a game of Jelly Blobs of Doom! While this background may not be right for all pets since the colors can contrast so much, it is still quite entertaining. This brings me to the last pet colour: Chocolate! Chocolate pets are one of my all-time favorites. Even though staring at them makes me want to down an entire Chocolate Brucicle or four, they are definitely the most fun to customise. There are so many chocolate, candy, and sugary items that you will have no problem finding the perfect outfit! The Chocolate Dream Background and the Gingerbread Dream House Background are both tremendous choices. If you are looking for a neopoint background, the Raining Doughnuts Background looks great as well. 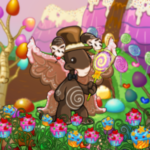 They match every Chocolate pet and are both beautiful backgrounds. The Gingerbread House Garland or Cookie Cutter Garland both look great with these backgrounds so be sure to try both! Now just add your favorite handheld and throw on some Gingerbread Wings or Sugar Cookie Wings and your Chocolate pet will be complete! I hope after reading this article you understand how to better customise your edible pets! I only gave a few examples of items that look great which each color, but there are several others that may also suit your needs. Of course there are several non lab-ray colored edible pets out there (say that five times fast!) but those are generally easier to customise. When customising, just remember the basics. First, choose a matching background. Remember you can always look up items related to your pet's color (for example, if you have a carrot Chia, you can look up carrot items and come up with quite a few wearables). Mix and match different items to find out what you like best. Lastly, have fun! If you are still not coming up with any ideas, you can always use an Inside TNTs Breakroom Refrigerator Background! It looks great with all edible pets. I must warn you, though, I wouldn’t actually brave going there myself unless you can run faster than the speed of meepits. After all, who knows what they have hiding back there? Man, I wanted a Pirate Paint Brush instead. A short little tale about an unlikely (but very real) friendship.